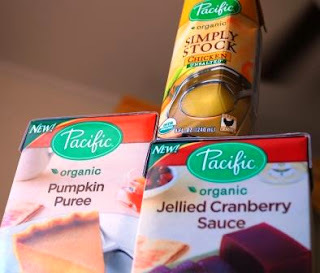 Pacific Foods and Tetra Pak sent me a fabulous seasonal kit for me to try out and review. All opinions and crumby goodness are my own. Cans of food have been under some amount of scrutiny as of late as to whether or not they may contain harmful BPA. 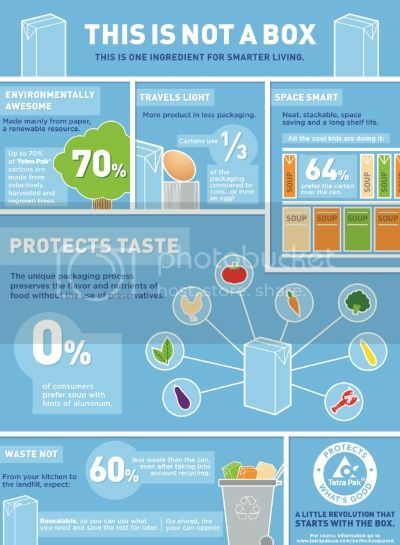 But what is a feasible alternative for long term food storage? Jars? Not really since they would cost more to transport and have a higher possibility of breakage or even spoilage due to light affecting the contents. So how about cartons? Perfect! Less space and weight due to packaging means less shipping costs to the producer and ultimately, to the consumer should they so choose to pass that savings along. Another pretty cool aspect of the cartons is that you don't need a can opener so it's great for camping or your emergency preparedness bag. These cartons are even re-closable so you can save the contents for later. 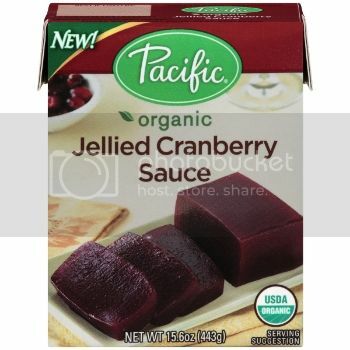 You can get all kinds of your favorite holiday ingredients in Tetra Pak cartons like chicken stock, cranberry sauce, and pumpkin puree. Even though I make my own stock, sauce, and puree, I almost always have a back up just in case. 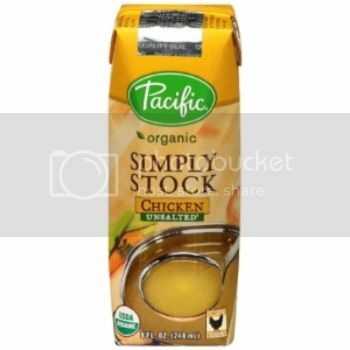 (Like just in case the stock isn't thawed by the time I need to use it; which happens far more often than I'd like to admit.) I do like the cartons far better than the cans because they stack and store so much easier. Tweet @CartonSmart and use #CartonSmart to tell us how you'll be carton smart this holiday. Maybe it's by making a recipe using smart packaging or an entertaining tip getting the most bang for your buck with little waste, whatever your tip, we want to know how you are #CartonSmart! If you want to learn how to Become Carton Smart visit the website or find some more ideas Follow #CartonSmart on Pinterest or on Twitter. I lurve plain old Cranberry Pumpkin Bread but at Christmastime, I always try to "tjuzs" up my baking. 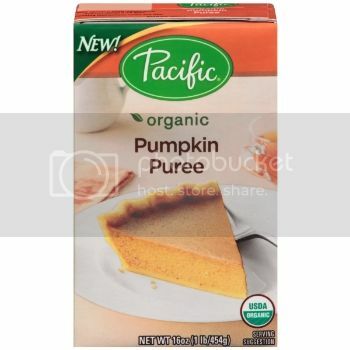 The Pacific organic pumpkin puree and cranberry sauce in the Tetra Pak cartons were the perfect ingredients for doing just that. Mix all ingredients and set aside. Keep in an airtight container in a cool dry place. Mix flour, baking powder, pumpkin spice, and salt in a bowl and set aside. In a mixer bowl put eggs, sugar, puree, and oil; stir until combined. Pour 1/4 of the batter into each loaf pan. Dollop 1/8c. of cranberry sauce in each pan and with a knife, swirl the sauce throughout the batter. Divide the remaining batter between the two pans. Top with 4-6 Tbs. of crumb topping before baking for 50 minutes or until a toothpick comes out clean. With a pastry cutter (or your hands) incorporate the ingredients until they are a crumb texture. This is part of Full Plate Thursday and a Christmas dessert round up with some of my favorite food bloggers. YUM! That looks super good - and I love your plated picture with the little present :) So pretty! I always feel better not using cans, less waste and less metals leaching into the food. Aw thanks Ms. Amanda! I'm with you on the metal! 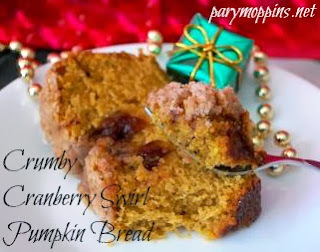 We would just love your Cranberry Swirl Bread, it looks awesome! Thanks so much for sharing with Full Plate Thursday and have a very Merry Christmas! Thanks Miz Helen and you too!